My son is 4 years old and LOVES his “Buddy”. Our son was premature and actually attended his baby shower where he received Buddy as a gift. Let me introduce you to Buddy. 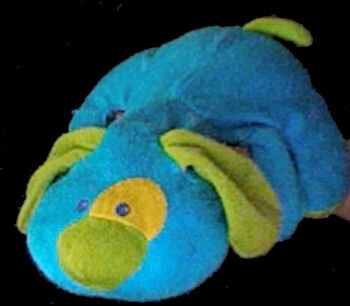 He is a blue plush puppy with green ears, nose, paws and tail. He also has a yellow patch around his right eye. Buddy also has a rattle inside. When new he smelled like baby powder and after hundreds of washings only recently lost that smell. Buddy was purchased at Target in 2005 and was manufactured by DanDee. My son sleeps with Buddy every night and carries him around throughout the house. Buddy over the years has developed several small holes, and I’m sure his stuffing will come out if washed again. PLEASE HELP US!!! Are you still looking for this puppy? If so, is this it? My, My, Brieanna! You HAVE been a busy lady this evening! I’ve notified everyone about your finds. Thanks Brieanna!!!!! Yes it was the “Buddy” that we had been looking for. I purchased it off ebay last night. Not sure if you paid any attention to the fact that you sent me that message almost 1 year to the date that I posted it, only 1 day off. I can’t begin to tell you how happy my son is to be getting a NEW Buddy. In the past year Buddy begin developing holes that I was continuously having to sew up to keep his stuffing in. Thanks again to you and to Plush Memories for helping my family!!!! Yes, I realized the date. That’s why I wasn’t sure you were still looking for him. I’m glad you have a new Buddy. I will keep my eye out for more.